Provide comfort for the family of Christopher Lucas with a meaningful gesture of sympathy. Christopher Anthony Lucas, 62, affectionately known as “Chris” of Toledo, Ohio, finished his course of life, in St. Ann Hospital on December 13, 2018. 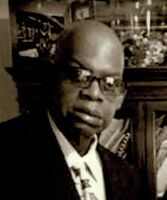 A 1974 graduate of Edward Drummond Libbey High School, Christopher worked various construction jobs, cashier of C&N carryout under the ownership of Charles and Nina Miller & family, and also other various jobs. He attended Rose of Sharon Church. Christopher was a self-proclaimed God ordained worshiper of God. He served the Lord with gladness. Christopher served in the U.S. Army Private 1, receiving an honorable discharge in 1976. He was preceded in death by his father, William Lucas; mother, Hester (Thompson) Lucas; sister, Sanita Perry; and brother, William Lucas, Jr. He leaves to cherish his memory, his brothers, Paul J. (Rachael) and David Lucas; step-brother, Broderick Randle, all of Toledo; SSGT Joseph (Maria) Lucas of Phoenix City, AL; Rev. Eric A. Lucas of Spartanburge, SC; sisters, Jovita (Herbert) Lucas, Angela Lucas, and Colia (Elder Eugene Sr.) Harris, all of Toledo; Jarvia (Elder Berkly Sr.) Walker of Orlando, FL; and a host of nieces and nephews. Viewing will be on Friday, December 21, 2018 at 11 a.m. with services at 12 p.m. at Rock of Praise C.O.G.I.C., 1632 N. Cove Blvd, Toledo, OH 43606. Pastor Eugene Harris will officiate. Interment will follow at Historic Woodlawn Cemetery. Special Thanks to Pastor Stanley Clark. Christopher is at rest for his battle is won, forever at peace for his work is done. To plant a memorial tree in honor of Christopher A. Lucas, please visit our Heartfelt Sympathies Store. Now and in the days ahead of this Christmas season & into the New Year, may Jesus our Almighty Jehovah God in the flesh, Emmanuel, richly bless you all as you remember Christopher's life legacy and celebrate his homegoing to Heaven, alive and well in the presence of our risen Lord, King Jesus. peacewithGod.net has been a source of hope & inspiration and we thoughtfully share as JWs, Joyful Witnesses, for our risen Lord Jesus Acts 1:8. "To be absent from the body is to be present with the Lord". This is the Biblical hope for a believer, such as Christopher, who put his faith & trust in our risen Lord. His memory will live on in the hearts of all who knew him. I'm so sorry for the loss of your beloved Christopher. Please find comfort in the loving promise from our Heavenly Father Jehovah that we can see our loved ones again right here on earth at John 5:28,29 when He calls them from their memorial tombs.